OSUN BABES 3 DELTA QUEENS 1. Delta Queens succumbed to their first defeat in four matches as Osun Babes took full advantage of the Okowa Ladies defensive lapses at the Osogbo City Stadium. 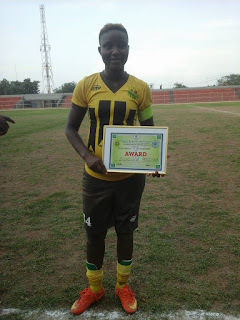 A double from from Sapele born striker Precious Edewor, and another from Warri born winger Kesiena Ojiyovw sealed the three points for the hosts, who got their second victory in the ongoing Nigerian Women Premier League. Rejoice Ikoyo did give Osun Babes hope when her instinctive low shot lofted over Akarekor Rita in the Delta Queens goal, as defensive pair of Maria Nwoko and Joy Jegede looked on helplessly. In a frantic start to the game, the Omoluabi Queens took the lead in the 27th minute when Edewor Precious found space from a very tight angle to slot in the ball far away from the range of goalkeeper Akarekor. It didn’t last long, though. The former league champions responded from captain joy Jegede's 37th minute free kick after Iloduba Sarah had bought down Emueje Oghiagbevia just at the edge of the 18 yard box. The resultant goal however led to some controversies, as the referee signalled for an indirect free kick, but the ball beat Osun Babes goalkeeper Linda Wajiakwu without any contact. Edewor almost turned provider with the scores at 1-1 when she found a free Ikoyo Rejoice, but the winger saw her attempt go just wide of the post to the despair of the home fans. Delta Queens looked more dangerous when going forward, though returnee Emueje Oghiagbevia and petit forward Maryann Ezeanagu looked on as constant threats throughout the first half, but the defensive pair of Iloduba Sarah and Elijah Esther were solid enough to hold on to their threats but the latter was still good enough to test Jiwaikwu, her powerful drive stinged the hands of the big keeper for safety. The first half however ended 1-1 as the two teams really showed class and entertained the fans at the stadium. After the break, Osun Babes took the initiative to again take the game to the Kwale based side, after Ossai Esther gave a sumptuous delivery to in form Edewor from the right-hand side as she dribbled pass Nwoko and gave a long cross to Kemi Abiodun, who headed away. Luck however ran on Osun Babes, as Kesiena Ojiyovw was well positioned to take advantage of a loose ball from Rejoice Ikoyo's threat upfront. The skilful player wasted no time to shoot a low driven volley to make it 2-1 for the home team just on the 53rd minute of play. The goal however happened to be her last action of the game as Marcus Grace was brought in for her. The former COD Ladies winger quickly got into action after the substitution, as she gave a pass to Ikoyo Rejoice who quickly cut inside, before unleashing a powerful drive which hit the edge of the lower bar. Edewor Precious finally sealed the three points for Osun Babes on the 67th minute, when she converted her kick from 12 yards after Ikoyo Rejoice had been recklessly mishandled inside the 18yard box by Delta Queens defenders. Her spot kick however made it a well deserved 3-1 for the home side. Osun Babes will still remain on the 6th position with seven points gathered. They will now face Saadatu Amazons in their last game of the first round in Minna, next week wednesday.